← Luxury Plastic: Plastic Surgeon or Credit Card? The number isn’t secret, the card qualifications are. 🙂 Reminiscent of the old days 80s/90s prior to when the card even existed, people will just have to wonder what magic qualifies an individual. Hey! I have been trying to get one for the past year.please help! what are the requirements? Good idea. I definitely think the Black card is ready to have some market share stolen away though. SMDI should definitely benefit from their strategic placement in the exclusive credit card market. As they learn and better cater the rewards their market, it will be easy to expand the membership of this card. I’m looking into buying some SMDI in the next few weeks. I think that it is over rated. My BoA black carbon card is 1. cheaper and gets me almost the same privileges. I just got sent a centurion, if you want more info on everything let me know. This annoys the crap out of me because I have friends who have this card solely because they run work expenses through it. All my expenses are personal ones–I would think that would matter more to AMEX, but apparently not. Have you had any luck yet? you can e-mail me at jaym1199@ yahoo . com. I would like to know the new requirements, please. Thank you. I am in HKG which bank can be more accesible. I think that i can park the 250K spending in a cd in AMX at O interst for the card, can you tell me who to call or who can refer me. would love some info. spend about $350K in last 12 months but no invite. can afford, spend more than te set limit. will mail you. 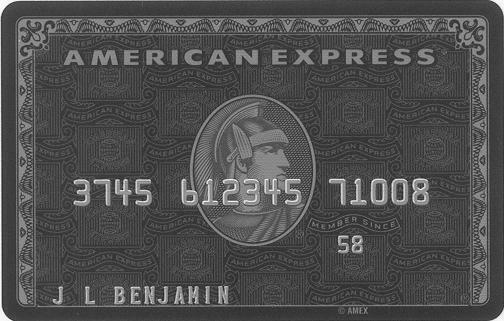 hello, the centurion card is now available in RSA. Please contact me by email if you would like me to put you in touch with relevant party to issue RSA centurion card.